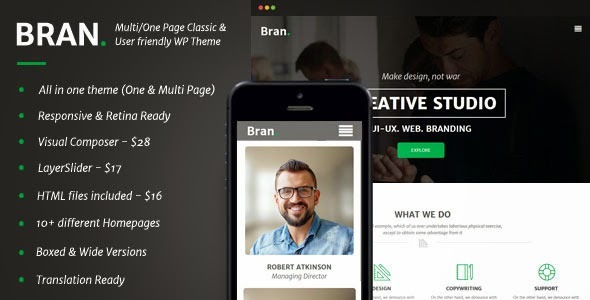 Bran is a Multi / One page WordPress Theme that fit any agency. If you have a creative design agency, web development agency, start-up company or any business company then Bran is your choice. On the other hand it can be used as a product page or service landing page. It comes with many features and plugins without the need to pay for, you will save $61 for: Visual Composer ($28), Layer Slider ($17) and a fully packed HTML version ($16). Also it offer a free and lifetime support & updates for the theme. Item Reviewed: Bran Multi or One Page Business WordPress Theme 9 out of 10 based on 10 ratings. 9 user reviews.